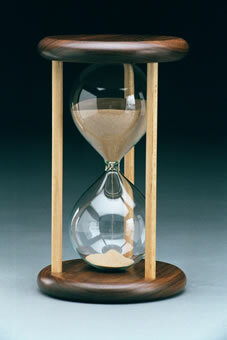 The glass in a Basic Wedding Hourglass is calibrated to a 60 minutes +/- running time. It is mounted in a personalized hand polished 9" high solid hardwood case. Laser engraved personalization on both end-caps is included. Laser engraved personalized end-caps are included. The personalized messages of your choice such as your entire wedding invitation, your wedding vows or another personal message laser engraved on one side and on the other side the names of the bride and groom along with the wedding date or another message if you prefer. It's your hourglass. Let me know what you want.